In 1894 Estero Island was uninhabited except for fishermen, smugglers and occasional squatters. A group from the Koreshan Unity had just arrived to establish a sawmill on a small portion of land on the south end of the Island, as pictured below. Men travelled in flatboats to mill the island pine trees within the area to establish homes on the Estero River Unity site inland. While some were building structures, wharves and docks, others were designing and building boats as the mail boat delivered to the sawmill once a week. 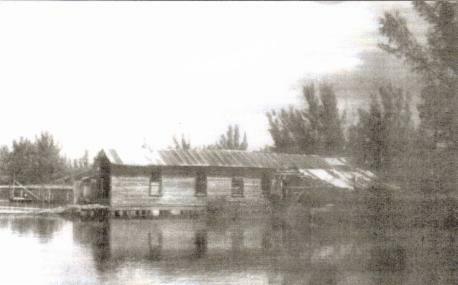 George Sanders, as an original member of the Koreshan group in Estero, decided in 1897 to break away from the Unity with his family to start the first boatyard and marine ways with a small store in 1905 as seen here. 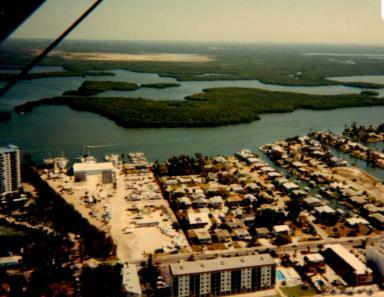 It was called the "International Trading Co." and built out to the channel on Estero Bay, as seen below. The "Carlos" post office was part of his company store and mail was shuttled to and from Punta Rassa three days weekly. In 1914 Sanders purchased an interest in the T.C.Hamilton two masted schooner which operated from the San Carlos Matanzas docks. He then supplied goods to Tampa, New Orleans and Mobile and sold to homesteaders and coastal people from Sarasota to Key West. The following year he started the first gas engine boat freight line which was run by his two sons. Theirs was a six hour trip each way running supplies up and down the Caloosahatchee River to Ft. Myers. 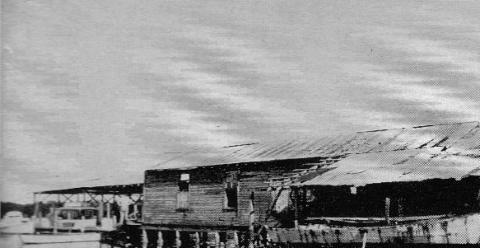 Meanwhile boats were built, repaired , painted and serviced while hurricanes and storms of the the 20's and 30's destroyed many of these structures and docks. 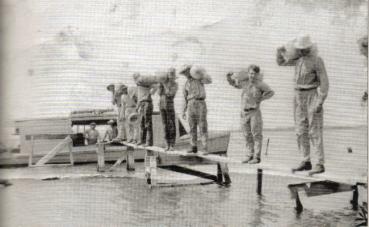 By 1940 son George had taken over the boat building and repairs. The homesite and repair shop on his seven acre site saw increased supply and demand and after WWII. Many larger charter boats and shrimp boats were on the marine ways or in drydock during the 50's and 60's. By 1969, the Sanders property was sold to Steve and Carol Terry, as seen here. They cleared the land to build their island home and "Mid Island Marina", offering covered storage, bait and gas at the boat barn. Soon after, boats were placed along Estero Blvd. 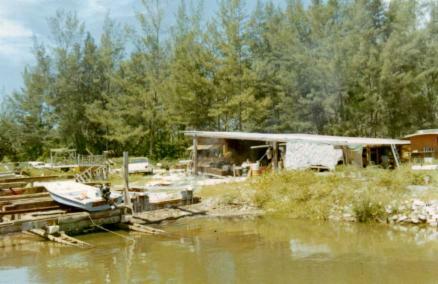 Boat sales were underway with new owners on Sanders Dr., as seen below. A small restaurant and tiki bar were next proposed on this quiet bayfront residential site. 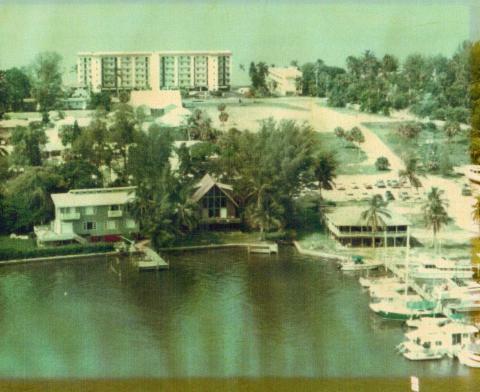 By the 1990's the Rusty Pelican restaurant followed by Fernando's offered bayside dining and boat rentals, pictured above. In 2003, the Publix supermarket and parking erased the Sanders street sign on Estero Blvd., where today a trolley shelter is placed for patrons. The parking lot serves as the entrance to Sanders Roadway where the "Fish Bight Marina" now stands, and The Bistro Restaurant on the Terry's homesite, with expanded floating docks are once again out to the channel where the International Trading Company began a century earlier.